The excluded bowel segment is draped in moist, warm sponges and then irrigated thoroughly with normal saline until the returning irrigation is clear. The antimesen-teric border of the bowel is incised using electrocautery. For the small bowel or sigmoid, a U-shaped plate is created by a side-to-side anastomosis with a 2-0 absorbable suture (Fig. 4). After the isolated bowel segment for augmentation is reintroduced into the peritoneal cavity, the ports are replaced to re-establish the pneumoperitoneum. 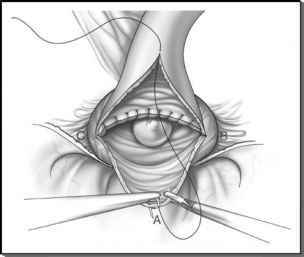 In ileocystoplasty, reintroducing a disposable 10-mm blunt-tip port with a fascial retention balloon and foam cuff to minimize gas leakage is warranted. In sigmoido-cystoplasty, the extended left lower abdominal port incision is reduced to accommodate a 5-mm port. The pneumoperitoneum is then re-established and the laparoscope inserted. The isolated bowel segment is oriented appropriately and inspected to exclude torsion of the pedicle. 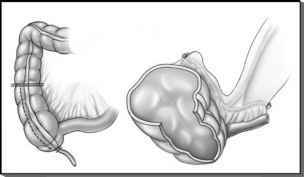 FIGURE 5 ■ Detubularization and reconfiguration of the right colon and ileum for cecocolocystoplasty in preparation for formation of a catheterizable stoma. Source: Courtesy of the Cleveland Clinic Foundation. 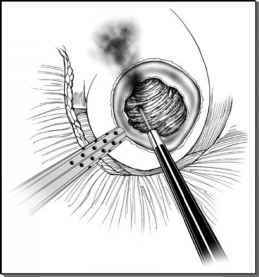 FIGURE 6 ■ Intracorporeal suturing of the isolated bowel segment to the bladder. Point A is at the apical aspect of the newly formed bladder flap that was derived from the anterior aspect of the bladder wall near the bladder neck. Source: Courtesy of the Cleveland Clinic Foundation. Placing the patient in extreme Trendelenburg position aids in displacement of the bowel loops from the pelvic cavity and facilitates the subsequent steps of the procedure. secured to the terminal end of the catheterizable segment of ileum with a suture for atraumatic intracorporeal manipulation and for delivering this terminal segment to the umbilicus for stoma maturation at the end of the procedure. The isolated bowel patch is then returned to the abdominal cavity and the pneumoperitoneum is re-created as described earlier. Exclusion of the bowel segment and subsequent restoration of bowel continuity can be performed intracorporeally using stapling devices and is thought to reduce any theoretical complications from undue tension placed on the bowel mesentery during the extracorporeal manipulation of the bowel in obese patients. We have not experienced any complications related to this proposed concern using this extracoporeal maneuver in obese patients. We prefer to routinely perform these manipulations extra-corporeally by delivering the bowel outside the abdomen through the umbilical or lower abdominal port site, respectively, for the following several reasons: (i) the bowel segment can be measured precisely and the mesentery incised after ensuring good vas-cularity, (ii) the bowel may be reanastomosed meticulously using open surgical techniques with increased confidence; (iii) the excluded loop may be irrigated without any peritoneal spillage, thereby eliminating the potential for subsequent pelvic abscess formation; (iv) the detubularization and desired modification of the isolated loop can be performed expeditiously by traditional open suturing; (v) if the mesenteric length allows the segment to be delivered outside the anterior abdominal wall comfortably without evidence of bowel ischemia, it is also likely to reach the bladder without tension; and (vi) the extracorporeal approach allows considerable savings in overall operative time and cost.